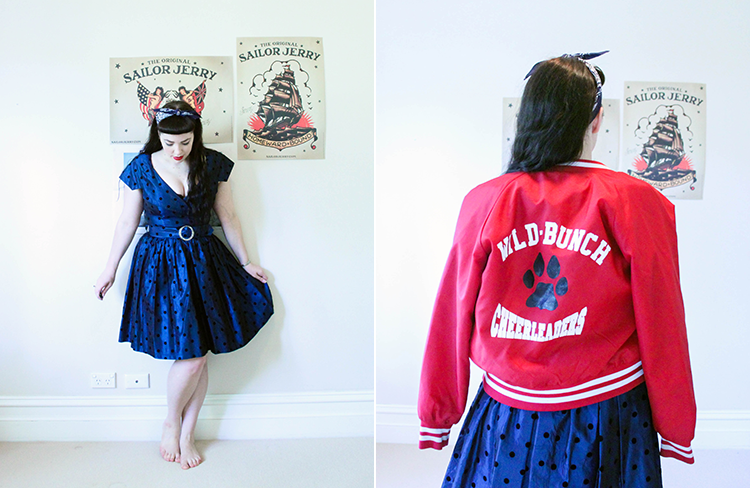 hey, here's something i haven't done in a while, an outfit post! i'm not trying to brag when i say i have so many clothes i literally can't fit them all in my overflowing wardrobe (and the wardrobe in my brother's old room, and several drawers...) but i know 90% of the people who read my blog are interested in pretty clothes, so i thought i'd share some of mine. 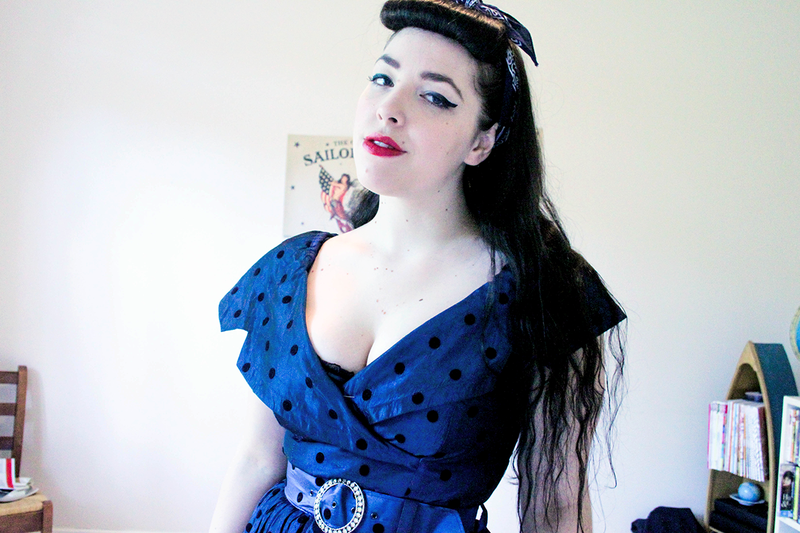 a couple of years ago i decided that from then on i was only going to buy perfect dresses. i was so sick of those horrible i-have-nothing-to-wear-i-hate-everything days and looking at half of my clothes thinking "i can do better." so i got rid of those cheap dresses i never wore and have been investing in perfect ones ever since. i feel like skirts and tops are less of an issue because you can always re-invent them and pair them with different things, but when you wear a dress, that's the whole outfit. it's so worth paying a little extra because now when i'm having one of those days or if i'm in a rush in the morning i can just put on a perfect dress and i know i'll feel great. 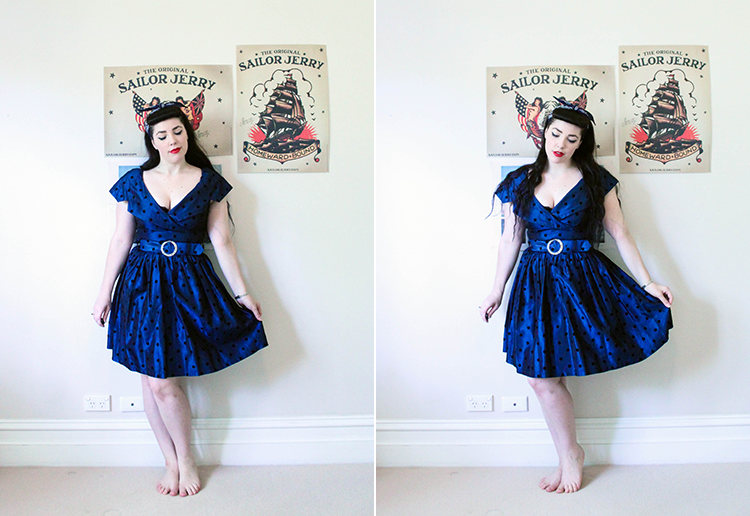 this particular dress is vintage and it came to me at the lady luck festival in the blue mountains last december. sometimes when you see a dress you just know it was meant for you before you even try it on. and i love finding perfectly sized vintage because it means it once belonged to another girl or woman the exact same shape as you. please excuse the unusually booby nature of this dress, i don't own many clothes with such a low neckline, but sometimes a girl just has to! the letterman jacket i'm wearing is also vintage, found at the retrostar warehouse sale in melbourne when i was down there in february. also you can't tell from the pictures but the polka dots are actually velvet and the belt buckle is made of faux diamonds, perfect! omg thats just perfect! you are gorgeous! In order to try and fit all my new clothes in my wardrobe, I went through a reluctant purging of my wardrobe, but it ended up being really great because I got rid of about 50% of my dresses! Like you, I have those days where I might wear a dress and feel like I can do better or feel like my outfit isn't truly me. Life is too short not to dress nice, I say! I always choose quality over quantity now and think of the things I buy as investments. I'd rather love my clothes and wear them to death than buy stuff just for the sake of buying it. to be honest i've just gone to the op-shops in different areas that i happen to be in, there are a few along brunswick street and my friend lives in richmond so i went to a few around there too. unfortunately i don't know them all that well and she is the one showing me around, but the retrostar vintage sale i went to last time i was there was fantastic! definitely go on a weekend they're having a sale if you can at all. and i'm definitely the same now, one of the biggest things that's put me off cleaning my wardrobe is that i just HATE listing things on ebay, it's such a pain and it takes me so long to get around to it so all the stuff i don't like just stays in my wardrobe until i finally take care of it, haha. You look wonderful in the dress! It is such a pretty blue color and the details are amazing. I can't wait to see your other "perfect dresses"
I love vintage clothes, but I am very bad at buying it (instead I just steal my mom's old stuff). I also get easily intimidated by the stall owners, even when they are really nice and helpful. I've also had the problem of not knowing what to wear, but I've resolved this problem by sticking to what I call a "uniform" and then hoarding other clothes for photoshoots. Gorgeous stunning dress, I adore vintage and polka dots. I have a very similar dress myself. I am planning to wear it to my graduation next week. Oh that is super pretty and looks really good on you! I defs want to see your other perfect dresses, haha. You are SO beautiful. Also, where are those AMAZING Sailor Jerry flash posters from? My hubby and I are OBSESSED. aww, thank you! ^_^ they're great aren't they? my friend actually stole them from the wall of a bar we were at, haha. they're promotional ones for the brand so i don't think they sell them but you can always try ebay? You are SO STUNNING!!! That dress is perfect on you, the dark blue with your porcelain skin and jet black hair is a match made in heaven. I love that you too made the decision to only invest in quality dresses that you love! For me it has been the best thing ever, instead of 'I hate everything in my closet...what do I wear..." it's "OMFG WHICH DRESS TODAY?? I LUFF DEM ALL" hehe. aww, you're too sweet! ^_^ it is definitely the best decision i've ever made clothing wise because now when i have those days where i can't be bothered putting together a top and skirt outfit it's just easy to throw on any of my dresses instead of finding them to be a problem too. That dress is stunning! It looks so good on you. I think that is a great attitude to have towards clothes, and I am glad you have managed to fill your wardrobe with things you ove! *_* u r so cute!!! love the dress!!!!!! You're gorgeous! The dress is lovely, I have a well overflowing wardrobe at home, but it's full of weird clothes I never wear, but I cannot physically get rid of anything! It's a serious issue. I miss my wardrobe's fullness at the moment though! God, what a beautiful shade of blue, it fits your skin tone perfectly and it give you a mysterious vibe, stunning! fun dress. it must be made just for you, you're right gal!